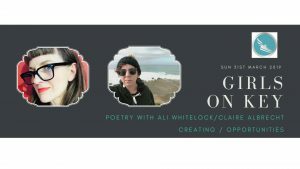 Come and listen to the hilarious and heart-rending poetry of Scottish/Sydney poet, Ali Whitelock at the Wollongong Girls on Key chapter on Sunday 31 March. Ali will also be joined by the talented Newcastle poet and convenor of renowned Newcastle poetry event Cuplet Poetry Night Claire Albrecht. Hosted by Girls on Key founder and Newcastle-based poet, Anna Forsyth. Open mic section for those wishing to read poems: 5 minute limit, sign up on the day. $10 or $8 concession door charge. Cash on entry. Girls on Key is a safe space and supportive of lgbtqia+ rights and pays respect and homage to the Indigenous owners of the land. Doors open 2pm, event starts 2.30pm. All genders welcome in audience and on open mic. Girls on Key is a feminist poetry organisation with readings around Australia. 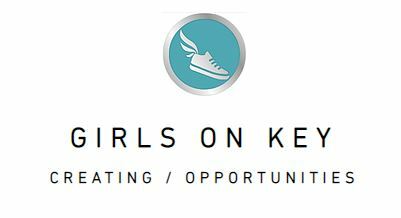 Girls on Key features women and non-binary poets and provides opportunities through publishing and events.